Last year, we had the awesome opportunity to create and design a user-friendly, waste-management system in partnership with our allies at WMEAC, The City of Grand Rapids, Kent County Department of Public Works, and ArtPrize to be used at Grand Rapids city-wide events. As we discussed in last year's post, the S.O.R.T. (Separate Organic, Recycling & Trash) Program serves as both a simplified waste-management system and an educational piece for folks who may not know which items are considered compost, recycling or landfill waste. S.O.R.T. it out—the right way. 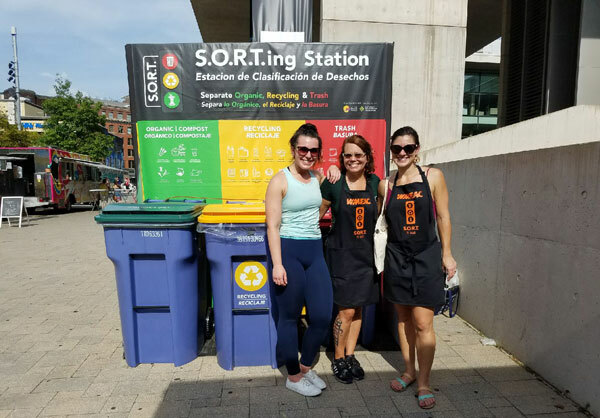 Team TIS spent an afternoon this week volunteering at various S.O.R.T.ing stations near ArtPrize venues (Rosa Parks Circle near GRAM and Ah-Nab-Awen Park near Grand Rapids Public Museum and Gerald R. Ford Presidential Library & Museum). S.O.R.T. volunteers are asked to assist eventgoers in properly sorting their waste. You may be wondering, "Why do they need volunteers to help people throw stuff away?" While this may seem like an easy/unnecessary task, there's actually quite a bit of confusion around which items at ArtPrize (and in general) belong in the compost, recycling and landfill. Before you head out to peruse ArtPrize, or before you throw something in the trash without giving it a second thought, check below for some quick tips on what belongs where. Bins with the GREEN lid are for ORGANIC/COMPOST waste. Bins with the YELLOW lid are for RECYCLING waste. Bins with the RED lid are for LANDFILL waste. There are icons indicating which items belong in which bin on the banners behind each designated bin. All ArtPrize food trucks are supplied with compostable plates, napkins and cutlery. Place these items in the COMPOST bin. Straws belong in the LANDFILL bin. Each S.O.R.T.ing Station has handy one-page recycling guides that folks can take home for their reference. Perfect for hanging on the fridge! Don't be afraid to ask S.O.R.T. volunteers for help—that's what we're there for! If you have any questions regarding which items belong where, give us a shout in the comments below—we'd love to help clarify! And if you're interested in volunteering at S.O.R.T.ing Stations this ArtPrize season, click here to sign up!